Machine Includes 561 Sewing Stitches (531 built-in, 30 on CD) Sewing, 11.25" Arm Quilting Space, Large 7x12" Embroidery Area Machine, 318 Designs, 17 Fonts, 14 Styles 1-Step Buttonholes, 140 Border Frame Combinations, 13 Project Bobbin Works Kit, Built-in Dual USB Ports, Sew Straight Laser Vision Guide, up to 1050 SPM, My Custom Stitch Digitizing, 11 Presser Feet, AHA Automatic Height Adjuster. Introducing the DreamCreator™ XE Innov-ís VM5100. Designed from the start with affordability and multi-purpose in mind, this versatile machine combines quilting, sewing, and embroidery into a single, surprisingly low-cost, must-have machine. Realize your dreams with 10% more workspace than most other Brother™ machines, and a spacious 7” x 12” embroidery area. Nothing is more frustrating for managing multiple projects than a slow machine. With V-Series, this hindrance is a thing of the past. 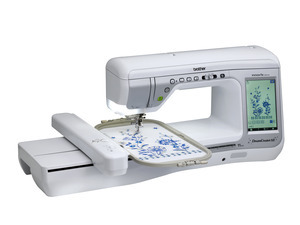 Enjoy stitching up to 1050 spm—and with over 560 total stitches available, the My Custom Stitch™ feature, the included bobbin work case, and more than a dozen bobbin work embroidery designs, this machine will revolutionize the designer in you. Furthermore, V-Series has optional accessories specifically designed to enhance DreamCreator™ XE—there are no ceilings to your creative expression and freedom. V-Series from Brother™: Technology has never looked so good. Includes 318 Built-In Embroidery Designs, 30 on CD, 18 Bobbin Works Designs. 140 Border and Frame Combinations. Large embroidery area 7" x 12" and two sizes of embroidery frames: 5" x 7" and 7" x 12"
Optional Upgrade to 8x12 and 8x8" Hoops.